Salt starts off as a movie trying too hard to be a slick action flick, then settles into a series scenes that are actually slick, before suddenly realizing it's success and becoming incredibly self-absorbed. It begins as a Bourne wannabe, but ends up as a Angelina Jolie adore-fest. While the movie wins no points for originality, it definitely makes it up with hard work. The screenplay works hard, the actors work hard and despite the ending our imaginations work hard. 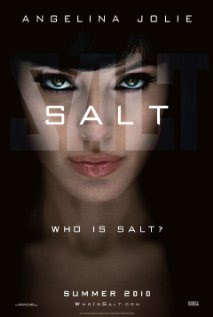 And like a hardworking puppy that wins you over, Salt compels you to keep watching despite all its inadequacies. Evelyn Salt (Angelina Jolie) is a spy working for the CIA. In reality though, she is a secret double agent, planted by the Soviets as little more than a child. For decades she grew up in the US, successfully infiltrating the US spy service. Till one day her spymaster Orlov (Daniel Olbrychski) shows up to suddenly expose her. Finding herself between a rock and a hard place, Salt has to sort her own loyalties out, and deciding if she was going to stay true to her adopted country or heed the call of her motherland past and act as the trigger for "Day X" - an operation that includes punitive strikes against the US. Yes, it is a good old sleeper cell story, spanning decades, with a strange throwback to the foes of yore. I am certain that part of the reason for making the movie PG-13 was because no one below that age would even care about Russians as the enemy. This anachronism isn't the only dissonance. The movie seems surprisingly short on extras to play security agents. As if the recession got to the Secret Service. This results in fight sequences that consist of long periods of running through empty corridors without meeting anyone. All action movies require, no demand, a certain amount of naïveté. And they add a certain nugget of "knowledge" to the audience. Salt's is the use of a taser on the driver of a cop car to twitch his legs into stepping on the gas. Tase on low for 40 miles and hour and medium for 60. Jolie is the earnest glue that keeps the movie together. Not knowing what her motivations are, keeps the entire sequence of events from sounding silly. Thankfully there are not too many background stories or clarifying voiceovers. That said, the term "Day X" could have used better nomenclature. A couple of action sequences are dizzyingly well done, explosions are limited, fights are meh, and the chases are mostly on foot. But all said and done, the movie stars Jolie. And that alone, as the producers would have surmised, makes the movie worth adding to the queue. And they are not mistaken.